Friends of the Jones Library System News: Bridging Cultures Muslim Journeys Bookshelf Grant awarded! Bridging Cultures Muslim Journeys Bookshelf Grant awarded! The Jones Library is one of 842 institutions throughout the country selected to receive a Bridging Cultures Muslim Journeys Bookshelf Grant from the National Endowment for the Humanities. 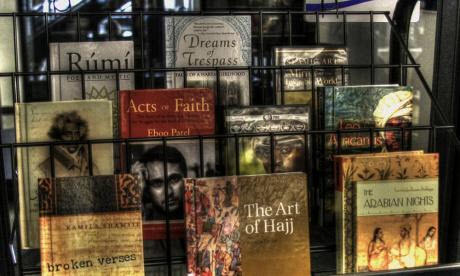 The Bookshelf Grant is composed of a collection of 25 books and 3 DVDs, as well as other supporting resources and access to Oxford Islamic Studies Online, an online resource of primary source documents and current works of scholarship. Programs exploring the themes of the Muslim Journeys bookshelf will take place in the fall of 2013. The Jones Library will partner with ION (Interfaith Opportunities Network), a local interfaith organization, which will help support the programming and extend the audience for the public programs. Lee Bridegam, ION Co-Convener, stated, “The ION membership is gratified to learn that Jones Library received this important grant, that will provide significant material to aid us all in the further understanding and clarification of our perception of Islam.” Having this local organization in collaboration with the Jones Library will enrich the experience for the entire community. For further information about the "Bridging Cultures" grant, please contact Janet Ryan at 413/259-3223.